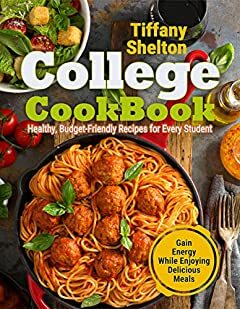 Gain Energy, Save Your Time and Feel Great with this Ultimate College Cookbook! Students don’t usually spend much time in the kitchen. But we’ve got your back. This book will give you an abundance of ideas for meals to eat that are delicious, easy to make, and give you the energy you need. and, of course, what cookbook would be complete without a touch of dessert? Select a few recipes, and relish in the delicious creativity that comes from combining their ingredients to make a lot of fun and, of course, a “yummy” dinner.